Long gone are the days when ceiling fans were simply a practical necessity. 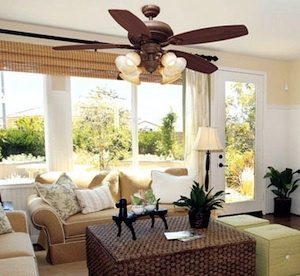 Now, ceiling fans are not only functional, but can also serve as a beautiful design accent to your home. When purchasing a new ceiling fan, there are several factors to consider, including blade size, shape, and motor speed. Determine the purpose of the ceiling fan. Is it simply decorative, or are you using it for lighting and ventilation? Don’t overlook this step because it plays an important factor in the decision-making process. Size matters. Ceiling fans come in almost every size imaginable. Choose one that fits the size of your room and the height of your ceilings. You obviously don’t want to choose something too big, as it will make your room feel cramped or even post a safety hazard. On the other hand, you need something that fills the desired space nicely, so you don’t want something too small. Choosing an appropriate size will also ensure greater energy efficiency. Decide on the motor type. There are two varieties of fan motors: friction driver motors and direct drive motors. Direct drive motors are the simplest option and can last for a longer time. Determine the type of mounting. How you need to mount your fan will depend on the ceiling height. If you have lower ceilings, it is recommended to choose a flush mount, so the fan remains as high as possible. If you have taller ceilings, you can install a down rod if you would like the fan to hang further down. Safety should be your utmost concern. Make sure that your fan is quality rated and that you won’t be overloading any electrical circuits by installing and using it. Overloading the circuits may lead to power outages and even fire. Electrical problems can also be costly to fix.